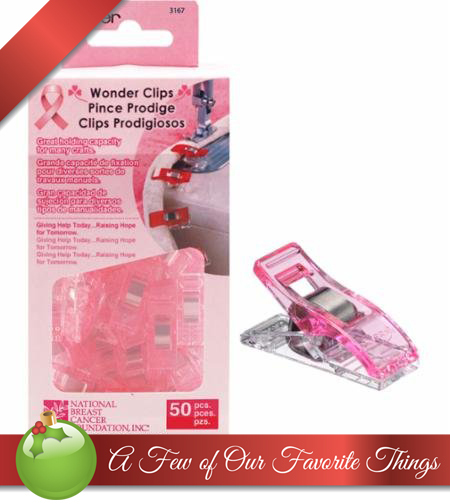 Wonder Clips Pink 50 count regularly priced $36.49, today $21.99. Support The National Breast Cancer Foundation to fund breast cancer initiatives with pink Wonder Clips. Wonder Clips are handy to use while sewing and quilting. Wonder Clips easily pinch open to securely hold your projects and are wonderful to use in place of pins. Seam allowance markings of 3/16'', 1/4'', and 3/8'' on clip base. For the next 12 business days, we will be offering a special product at a special price. You can purchase any quantity of that day's special. You can purchase just one day or all 12 days. The promotion is valid until midnight central time of the email date. We will hold all the items until the last day and ship them all together to save you on shipping. All discounts will be reflected at the register. Adjustments (shipping and product discount refunds) for web orders will be handled prior to shipment of products. We will begin shipping web orders on Tuesday, Dec. 16. All kits are "while supplies last." Monday - Saturday 10 a.m. - 5 p.m. | Thursday 10 a.m. - 7 p.m.